Can a newborn infant accurately record traumatic experience? Can early truamas be retained in memory? How would such traumatic memories affect later development? Where should we look for evidence of such traumas in adult patients? If Someone Speaks, It Gets Lighter provides surprising answers to these questions. Taking as her point of departure both her own clinical experience and case reports in the analytic literature, Lynda Share provides a thorough, at times revelatory, examination of the basic issues. She proposes that the controversy between narrative and historical truth be redefined in terms of the distinctly different memory systems involved and in terms of the special mechanisms whereby trauma, as opposed to ordinary expectable experience, becomes a major unconscious organizer of behavior and memory. 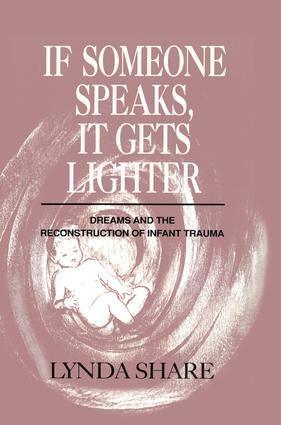 Then, winding her way skillfully through contemporary debates about the limits of reconstruction, she argues persuasively that the impact of early infantile trauma can become accessible through disciplined analytic inquiry. Indeed, for Share, to forego the possibility of reconstructing such traumas in favor of an exclusively here-and-now interpretive approach is to risk perpetuating the trauma in all its pathogenicity. By contrast, when trauma can be reexperienced meaningfully in treatment, both behavioral reenactments and trauma-related transference issues can be dramatically clarified. Demonstrating her point with vivid clinical case reports, Share emphasizes the special value of dream interpretation in recovering the full psychological impact of events that occurred in the first few years of life. Through the imagistic dimension of dream formation, unconscious traumatic memories gain access to an expressive vehicle through which the patient, aided by the analyst's understanding, can begin to work through early experiences that have heretofore been dimly known but not felt.